As part of a wide selection of value added services, Waukesha Metal Products offers certified metal welding capabilities to complement our fabrication processes. 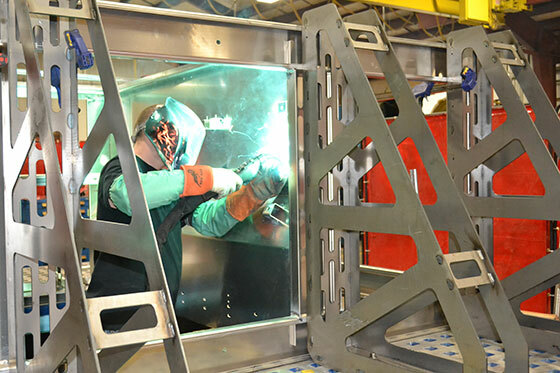 Our welders are often put to work in the design and manufacturing of fixtures built for fabrication processes, and for spot welding subcomponents of larger assemblies. Our capabilities range from traditional manual welding to automated welding processes, including resistance / spot welding, MIG welding, TIG welding, and robotic welding. Gas metal arc welding, or MIG welding, is one of the most popular choices among customers of Waukesha Metal Products. Because of its relative speed and versatility compared to other welding options, MIG welding is ideal for time-sensitive projects. TIG welding, also referred to as gas tungsten arc welding, is a manual welding process that produces extremely precise welds. Waukesha Metal Products’ TIG welders can be used to weld all kinds of geometries and overlays. To make sure your parts receive only quality welding, Waukesha Metal employs a team of highly skilled welders with years of TIG welding experience. Waukesha Metal Products specializes in TIG welding for thin sheet metal where tight welds are more important than shorter lead times. Waukesha Metal Products can offer both manual and robotic welding, depending on the needs of our customers. Robotic welding allows us to automate the welding and part handling of simpler projects, creating efficient welds with shorter lead times and lower labor costs. This process also allows for a more efficient use of filler material because machines are less prone to waste than a manual operator. For larger-scale projects, robotic welding might be a more cost effective option. However, more complex welds are better suited for manual welding options. Visit our videos page to get a look at some of our welding capabilities.